Ever wished you could capture stunning images of the night sky? Thought you needed complicated and expensive equipment? 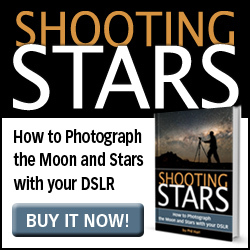 Shooting Stars has simple instructions for getting you started using your camera under the stars. The only other piece of equipment you need to get started tonight is a tripod. In addition to simple advice about the camera settings to use for each style of night sky photography, Shooting Stars provides detailed discussion of the finer points of imaging in low light conditions. It’s a reference you’ll keep coming back to and will help even professional photographers learn more about their camera and how to use it at night. Click to view the complete Table of Contents to see just how comprehensive this eBook is. Part 1, The Sky at Night, introduces some basic astronomy concepts, to help you understand what you can expect to see at night from different places on Earth and at different times of the year. This part includes a description of how and why the phase of the Moon varies each month and at which times of the year you can expect to see and photograph the Milky Way. Part 2, Night Sky Photography, is the heart of the book. It begins by discussing your camera and lenses and how to use them to turn the faint light of the night sky into stunning images. Most importantly, it describes three techniques for how to get accurate focus at night when your autofocus fails you. At least one of these techniques is guaranteed to work with whatever camera and lens you are using. This section also describes additional equipment and accessories that will enable you to do more with your camera at night and help make the experience more enjoyable. Having established the fundamentals, Part 2 of Shooting Stars then describes the camera settings required for the different styles of Night Sky Photography: Twilight Landscapes, The Moon, Night Sky Scenes and Star Trails (as above) and Timelapse Video (below). Part 3 of Shooting Stars covers Image Processing, concentrating on the particular techniques and steps you will need to get the most out of your night sky images. Examples and screen captures are provided for Photoshop, Lightroom, ACDSee and Aperture but the instructions can easily be applied using other image processing applications. Part 4, Wonders of the Night Sky, will inspire you to get outside with your camera more often. This final part covers interesting events, features and phenomena that you can see at night and how to apply night sky photography techniques to capture them. Topics include Comets, Meteors, Conjunctions, Eclipses of the Moon, the Milky Way, Satellite Flares, the Aurora Borealis and even Bioluminescence. Each topic features more of Phil’s stunning images and the stories behind them. Your book is awesome!! I just bought it this week and read through it. It is responsible for me capturing a photo of the International Space Station tonight. This was the best money I've ever spent with almost immediate results. Am truly impressed by the content - illustrations,settings and photographs.You should be really proud of one of the most informative books that I have ever read on night sky photography.which seems to contain everything one needs to know. Amazingly informative and beautifully illustrated! My husband and I are thrilled with this book because you have suggested solutions to problems we have faced in our photography. This book is worth five times the price! Lots of great content, and you really got me fired up to try some night sky photography. The book looks like it must have been a ton of work and I really appreciate it. Well worth the money. 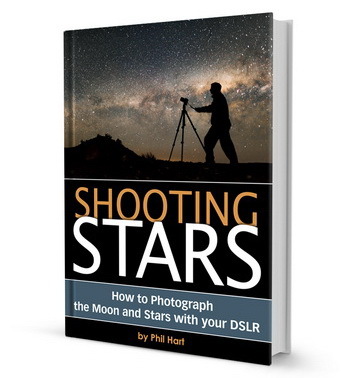 I've been a long-time fan of Phil's work, and I thought I was reasonably confident in shooting night sky scenes, but this book has taught me some things that I'll be trying on my next night out! A must-read for beginners and experienced photographers alike who want to capture the beauty of the night sky. This handy field guide provides a quick summary of the exposure settings you need for each style of night sky photography. It also describes where to find camera settings particular to this type of photography on popular DSLRs from Canon, Nikon, Olympus, Pentax and Sony. Phil Hart has been enjoying and photographing the night sky for nearly twenty years. His award winning photos have been published in books, magazines and popular websites around the world and in 2012, Phil was the winner of the prestigious 'David Malin Award'. 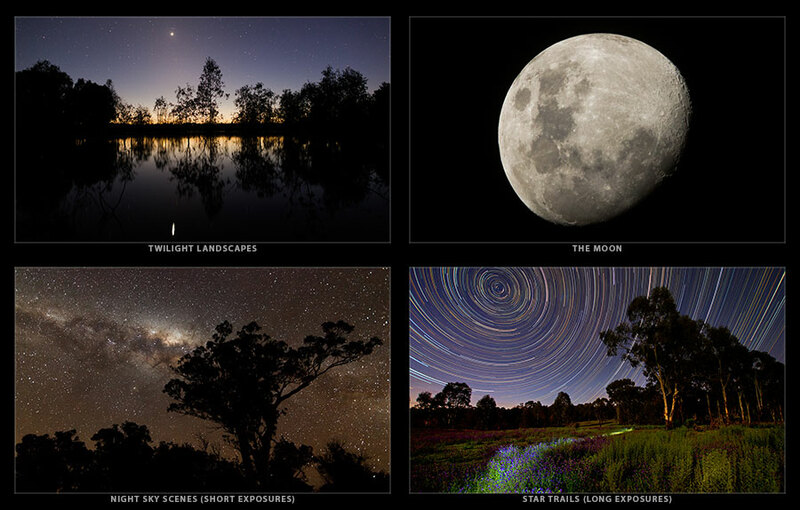 Phil also runs Night Sky Photography workshops with Michaels Camera Store, one of the largest retail camera stores in Australia, and all of the information in this book has been thoroughly road-tested by participants on these workshops. 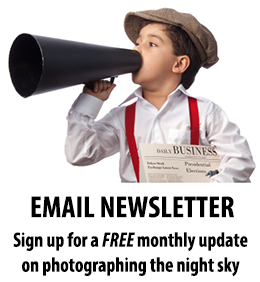 You can follow Phil and the beautiful images he captures on Google Plus or the Night Sky Photography Facebook page. Where to find the ten most common night sky photography settings on the dials and menus of just about every DSLR from Canon, Nikon, Sony, Pentax and Olympus. I guarantee your DSLR is included or your money back, but you can also view the full list of included models here. Updated recommendations on wide angle lenses to use for night sky photography. Image processing section has been updated with instructions for Lightroom 5 and ACDsee Pro 8. New instructions for processing star trails with StarStax and updated info on rendering timelapse videos with Virtual Dub. A detailed page on "Using Your Timer Remote (Intervalometer)" for star trails and timelapse. Checklist of "What to Pack" before heading out on a night sky photography expedition. Updated lists of Lunar Eclipses and Phases of the Moon. Shooting Stars is great value and I'm certain it will help you take new and exciting photos of the night sky with your DSLR, as it has for many happy photographers already. But if you are not 100% satisfied, I’ll refund your purchase no questions asked within 30 days. So if you have ever wanted to photograph the moon and stars, there is no reason not to try it now! Download your PDF copy of Shooting Stars Now! Shooting Stars is great value at just US$14.95 for well over a hundred pages of valuable instructions and beautiful images. Click the download button to pay for your copy with Credit Card or PayPal now. To pay by Credit Card, hit the 'Checkout with PayPal' button in the Shopping Cart and then select 'Pay with a debit or credit card'. With immediate download, you can be reading Shooting Stars in just a few minutes. For information about reading and saving PDF files on an iPad with the Apple iBook app, click here. You might also like to check out the free Amazon 'Send to Kindle' App which can be used to send your copy of Shooting Stars to your Kindle, iPad or Android device. If you would like to become an affiliate and earn commission selling Shooting Stars, click here for details.